Murder by Gaslight: The “Rough on Rats” Murder. A Woman Found Guilty of Murder in the First Degree—Her Husband Awaiting Trial. Muskegon, Mich., Feb. 19—The Jury in the case of Mrs. Korun Larson, after being out eighteen hours, brought in a verdict of murder in the first degree.. She poisoned John Guild on the first of August last with “Rough on Rats.” Her husband awaits trial on the same charge. She was remanded for sentence until March 3. The Larsons lived on a farm owned by Guild, who was a single man, sixty years of age. In 1883 he deeded the farm to Mrs. Larson on condition that she should furnish a home during life. On the first of August in that year Guild died suddenly, and the contents of his stomach being analyzed, ten and a half grains of arsenic was found. 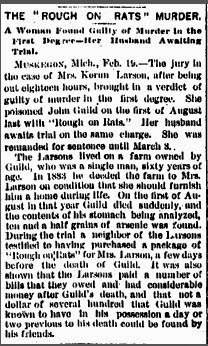 During the trial a neighbor of the Larsons testified to having purchased a package of “Rough on Rats” for Mrs. Larson, a few days before the death of Guild. It was also shown that the Larsons paid a number of bills that they owed and had considerable money after Guild’s death, and that not a dollar of several hundred that Guild was known to have in his possession a day or two previous to his death could be found by his friends. "The "Rough On Rats" Murder." Kalamazoo Gazette 20 Feb 1884: 1.